Even though affordable project-studio equipment has allowed many producers to record and mix music without having to watch the clock on financial grounds, time often remains the biggest enemy. This is because the lack of formal session constraints encourages people to hedge their bets sonically, deferring important sound decisions until mixdown rather than recording with a clearly envisioned final result in mind. Much of the advice I've offered in past instalments of this column has been about how to avoid this trap by committing to recording things from the outset the way you want them to sound in the end — a much more time-efficient working method. However, I'm occasionally asked to record in such a way as to keep lots of sonic options open, perhaps because the needs of the arrangement are still uncertain, or because I want to allow a different engineer enough freedom to develop their own vision for the mix. 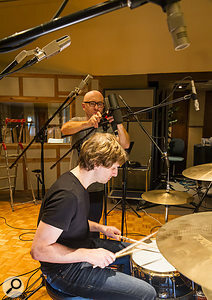 One such session was when I was recently asked to track a rock trio at a local commercial studio, and in this case, the drummer had an additional reason for wanting maximum mixdown flexibility: he also wanted to use my mic setup to sample his desirable '90s-vintage Tama Star Classic kit so that he could develop his own sample-library product. With this in mind, my goal with the miking was to be able to achieve a satisfying a band timbre without recourse to heavy mix processing, no matter how dry or roomy the target sound at mixdown. In addition, I was keen that the mic signals should also allow the mix engineer some freedom to adjust the relative balance and tone of all the instruments if they wished. 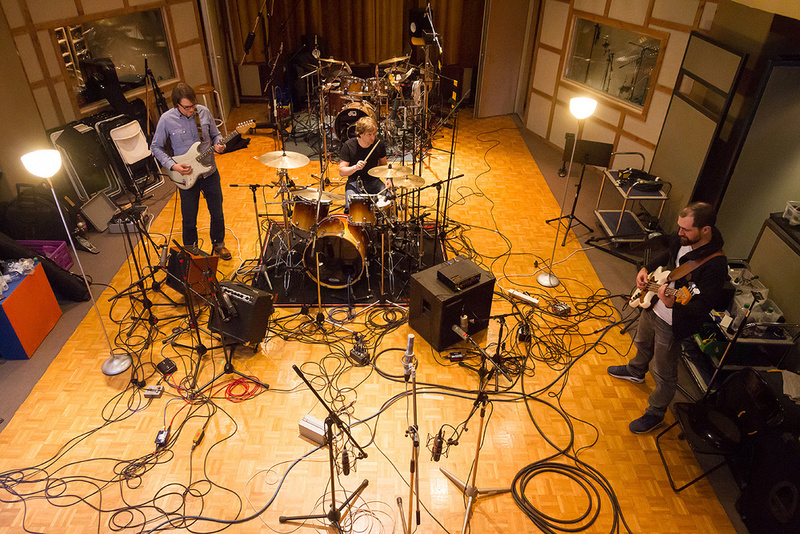 More specifically, the basic plan was to capture a full set of close mics for the drums, cymbals, and bass/guitar amplifiers that would be able to stand on their own if a dry mix was required, but then to supplement those with several stereo mic pairs capturing the whole band sound from different distances. Blending any or all of the mic pairs with the close mics would allow me to generate a wide range of more ambient perspectives, while retaining a useful degree of balance control over individual instruments. As far as the drums were concerned, it might seem on the face of it logical to begin work with the close mics in this situation, but I actually chose to start with the closest mic pair. This is partly just a reflex on my part, but there are good reasons I've made it a habit. Firstly, the process of finding a sensible miking position for overall kit pickup involves comparing the live-room and control-room sounds by ear, so you immediately start listening critically to the natural acoustic sound of the drums. And once you manage to get that first mic pair sounding representative in the control room, that can provide a powerful reality check when you're judging the success of your close mic positions. In other words, because that first mic pair's more distant placement typically picks up a more natural sound, it really highlights whether your close-miking choices are misrepresenting the timbre of any individual drum or cymbal.